Now MS. Harley 7368 in the collection of the British Library, the manuscript's provenance can be traced back to 1728, when it belonged to a London book collector named John Murray. He donated it to the collection of Edward Harley, 3rd Earl of Oxford and Earl Mortimer, who bequeathed it to the British Museum with the rest of his manuscript collection in 1753. Some time between 1728 and 1753 the play was bound with another manuscript, The Humorous Lovers. Now in poor condition, the original manuscript probably consisted of 16 leaves—31 handwritten pages of a working draft of the play (foul papers), with the last page blank. Two or three of the original leaves have been torn out, and seven leaves and two smaller pieces of paper have been inserted. 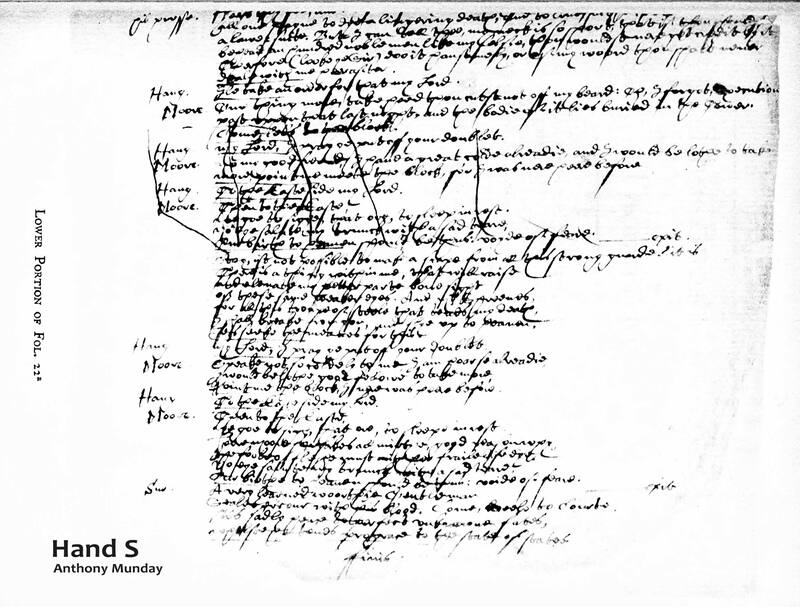 1) Folios 3–5, Hand S: the first three scenes of the play, through page 5a; censored by Edmund Tylney, the Master of the Revels, but otherwise intact. On page 5b, all text after the first 16 lines is marked for deletion. At least one, and probably two, of the leaves immediately following (the original leaves 6 and 7) are missing. 2) Folio 6, Addition I, Hand A: a single leaf, written on only one side. The addition is misplaced, and belongs later in the play, with page 19a. 3) Folios 7–9, Addition II: three leaves replacing the excised material on 5b and the original 6 and probable 7. Each of the three leaves is in a different hand. Folio 7a, Addition IIa, Hand B: a scene to replace a short deleted scene on 5b. Folio 7b, Addition IIb, Hand C: another complete scene, with stage directions leading to its successor. Folios 8–9, Addition IIc, Hand D: a three-page scene (page 9b being blank), with about a dozen corrections in Hand C.
4) Folios 10–11, Hand S: back to the original manuscript, though with some insertions on pages 10a and 11a in Hand B. 5) Folio 11c, Addition III, Hand C: the first of the two insertions on smaller pieces of paper, formerly pasted over the bottom of page 11b, and consisting of a single 21-line soliloquy meant to begin the next scene. 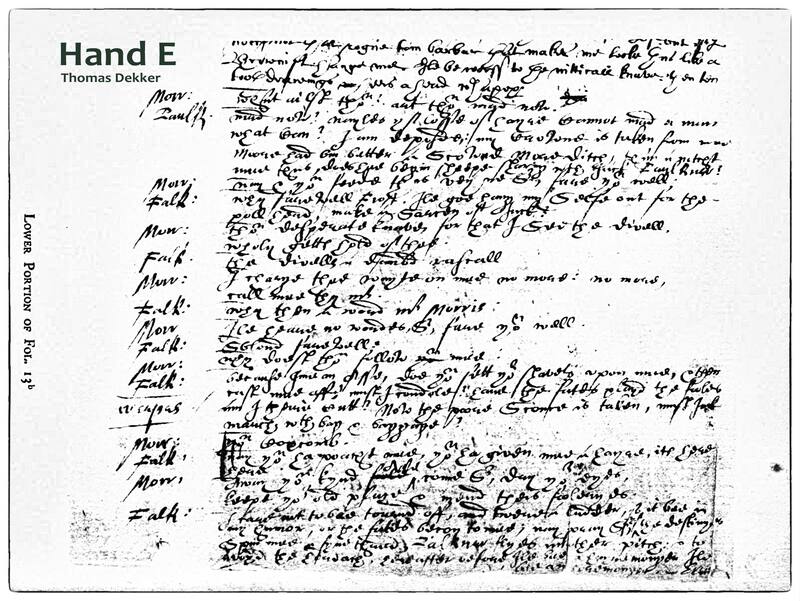 6) Folios 12–13, Addition IV, Hands C and E: four pages to replace excised or cancelled material, written mainly in Hand C but with input from Hand E on page 13b. 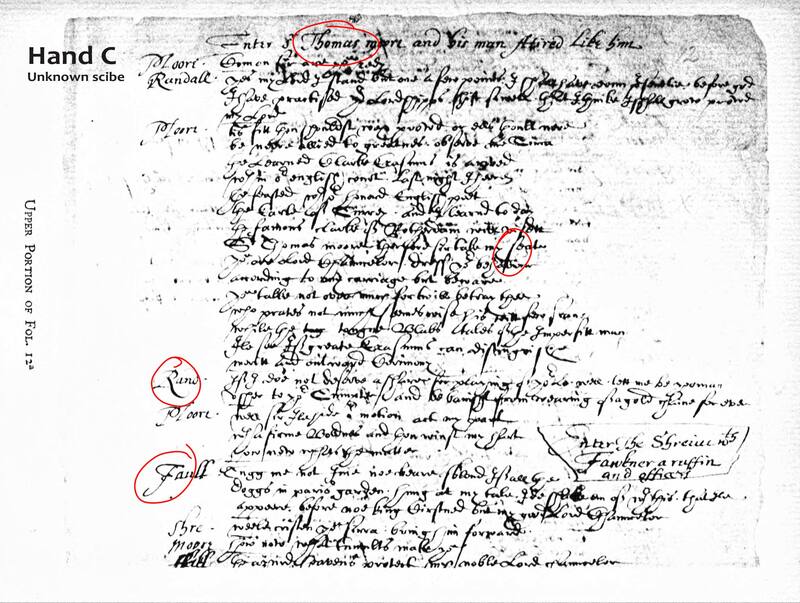 7) Folio 14a Hand S: the original again, and the whole page cancelled for deletion. Addition IV, directly previous, replaces this material. 8) Folio 14c, Addition V, Hand C: the second of the insertions on smaller sheets of paper, formerly pasted over the bottom of page 14a. 9) Folios 14b and 15, Hand S: the original again. 10) Folio 16, Addition VI, Hand B: the last of the six Additions. 11) Folios 17-22a, Hand S: the conclusion of the play in the original version. On page 19a a long passage is cut, and this is the place where the mislocated Addition I, folio 6, actually belongs. Scholars, critics, and editors have described the text as "chaotic" and "reduced to incoherence", but in 1987 Scott McMillin maintained that the play could be acted as is; and at least one production of the play has ensued, by the Royal Shakespeare Company in 2005. 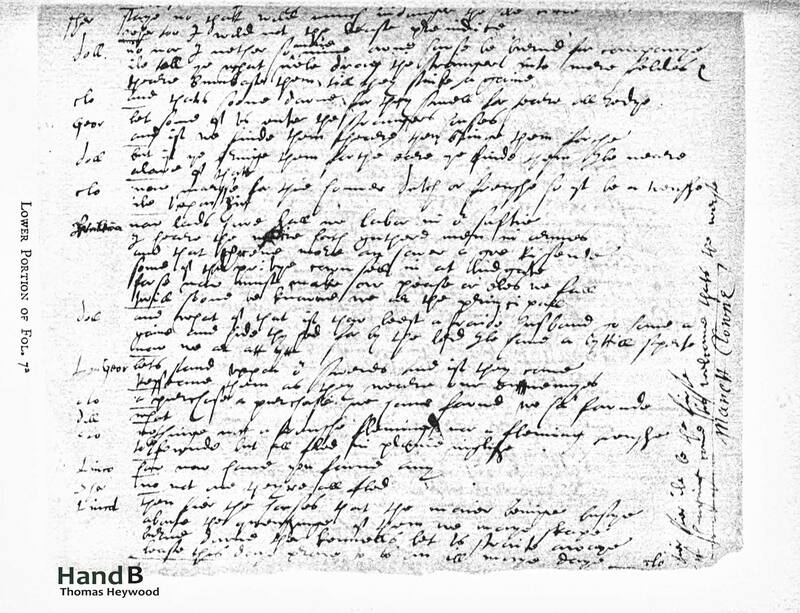 The manuscript was first printed and published in 1844, two and a half centuries after it was written, by the Shakespeare Society, edited by Alexander Dyce; and again in 1911 by the Malone Society, edited by W. W. Greg. Part of the need for revisions of the play was clearly due to purely practical concerns of stagecraft, apart from the demands of political censorship. Much of the point of the revision was to streamline the play, to make it more actable; though even the revised version would have needed a minimum cast of 18—13 adults and five boys. Two of the Additions, III and VI, occur at the beginning and end of the middle third respectively, giving more time for costume changes. Addition III provides a soliloquy by More and a 45-line dialogue between two actors; Addition VI provides a similar breathing-space for the actors to get ready for the play's final phase. Allowing for a range of uncertainties, it is most likely true that the original text of Sir Thomas More was written ca. 1591-3, with a special focus on 1592-3 when the subject of hostility against "aliens" was topical in London. Edmund Tylney censored the play when it was submitted to him for approval at that time, for this topicality as well as for more general considerations of controlling political expression on the stage. The effort at revision is difficult to date; many scholars have favoured ca. 1596, though a date as late as ca. 1604 is also possible. 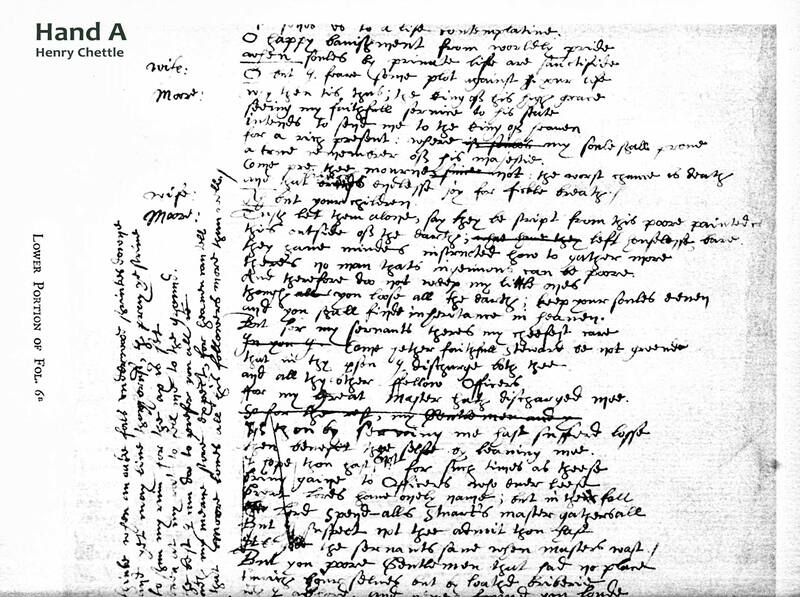 The manuscript is a complicated text containing many layers of collaborative writing, revision, and censorship. Scholars of the play think that it was originally written by playwrights Anthony Munday and Henry Chettle and some years later heavily revised by another team of playwrights, including Thomas Heywood, Thomas Dekker, and William Shakespeare. 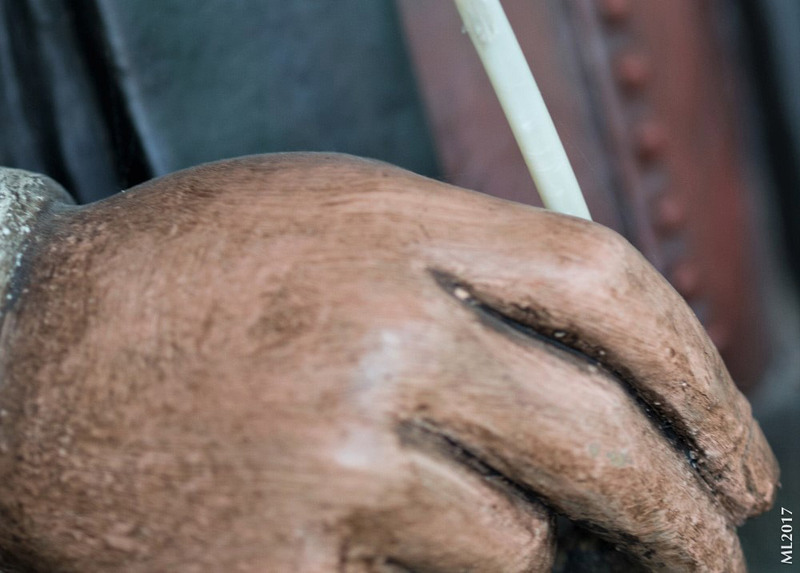 HAND E – Thomas Dekker. Munday, Chettle, Dekker, and Heywood wrote for the Admiral's Men during the years before and after 1600, which may strengthen the idea of a connection between the play and that company. Shakespeare, in this context, seems the odd man out. 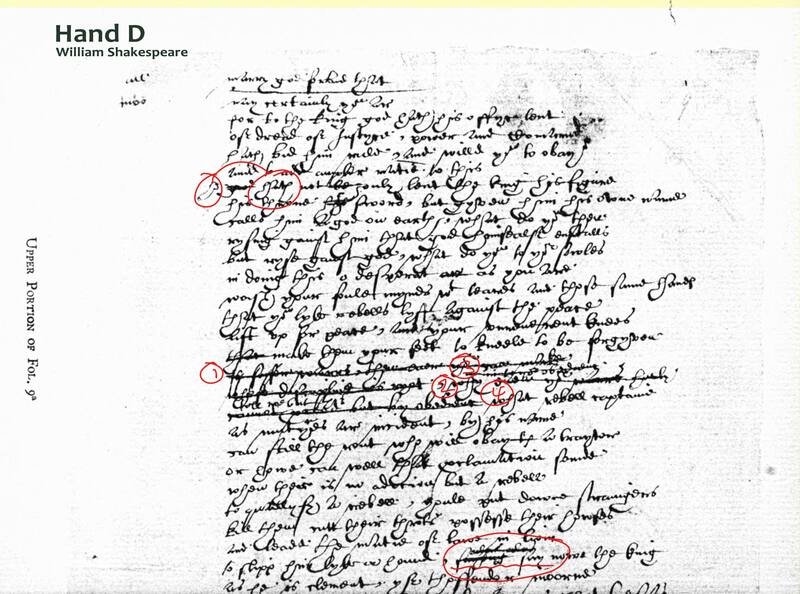 In his study of the play, Scott McMillin entertains the possibility that Shakespeare's contribution might have been part of the original text from the early 1590s, when Shakespeare may have written for the Lord Strange's Men.